Neptune Society proudly supported the veteran community in Orlando, FL as a sponsor of the American Legion Department of Florida 98th Annual Convention. 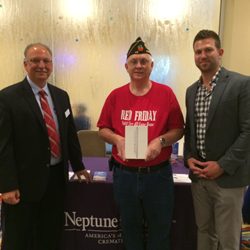 As well as being a corporate sponsor and the preferred cremation partner of the American Legion, Neptune Society Orlando hosted a drawing for an iPad mini, and the grand prize winner was veteran Gatha "Butch" Owens. Neptune Society member and veteran John Purmort with David Jacobson at the American Legion Department of Florida 98th Annual Convention. With over 40 years of experience helping veteran families around the country, Neptune Society knows how to handle the forms and applications necessary to receive appropriate cremation benefits. Neptune Society welcomed veterans to its booth to provide all veterans information about cremation services. Along with complimentary pens and mints, veterans could choose to pick up one of two brochures. The first brochure highlighted and displayed information about Neptune Society’s products and services that are available for veteran needs. The second brochure discussed the “10 Facts” which provides crucial information about veteran cremation and the benefits veterans can receive from the government in return for the sacrifices they had made for our country. Neptune Society staff David Jacobson and David Mennillo were also available to educate veterans about the benefits they can receive from the government for cremation. With over 40 years of experience helping veteran families around the country, Neptune Society knows how to handle the forms and applications necessary to receive benefits such as a flag, interment at a National Cemetery, and reimbursements for cremation services. The American Legion’s statewide convention welcomed approximately 3,000 veterans and their family members to the Renaissance SeaWorld in Orlando, FL June 16-19. Numerous opportunities for leadership training and other workshops were offered for the members of the American Legion Department of Florida. Members were also able to vote for new leadership for the coming year and celebrate the successes of the year prior. Among the many veterans that Neptune Society met for the first time, the Orlando staff also met Neptune Society members and others who were concerned with the details of preplanning. They were also proud to greet many of the Post Commanders of the American Legion, who lead and guide their local chapters’ activities. The Orlando staff of Neptune Society is honored to serve veterans and their families in all aspects of life. Those who wish to discuss a veteran cremation for themselves or a loved one, should contact the nearest office today for more information about how to plan with America’s most trusted cremation provider.